Have you used Interactive Math Notebooks? Are you hesitant about where to start? Do you feel overwhelmed with where to start? I felt all of these same feelings ten years ago. Many of the teachers I was teaching with were using Interactive Notebooks. I was overwhelmed with where to start, what would they look like, how would I grade them, etc. The list went on. I looked at my fellow teachers notebooks and then I jumped in the Notebook pool and never looked back! I loved using Interactive Math Notebooks in my Math classes. There are so many reasons to do this in your classroom too! Here is a little bit about Interactive Math Notebooks to think about if you are deciding whether or not to use them in your classroom too. First, what is an Interactive Notebook? It is a notebook (spiral 120-page or bound 100-page) used to organize information for a specific subject area. The teacher determines how it is setup, organized, and managed. Why should I use an Interactive Notebook in my class? It teaches students to organize information as a resource, accommodates different learning styles, instantly builds a Math portfolio of each student's work, and makes students take ownership of their learning process. 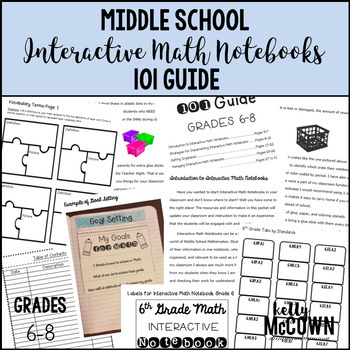 A Middle School Interactive Math Notebook 101 Guide is for perfect guide for starting Interactive Notebooks in your Math classroom. This is a great resource to use in starting your Interactive Notebooks and maintaining them for the entire school year! This resource contains EVERYTHING you need to accomplish having success with Interactive Math Notebooks in your classroom. -Additional Resources will be added for FREE!! I hope this resource is helpful to you in your endeavors with Interactive Math Notebooks. I know this tool helped my Math students increase learning gains in Mathematics, and I wish your students the same success!